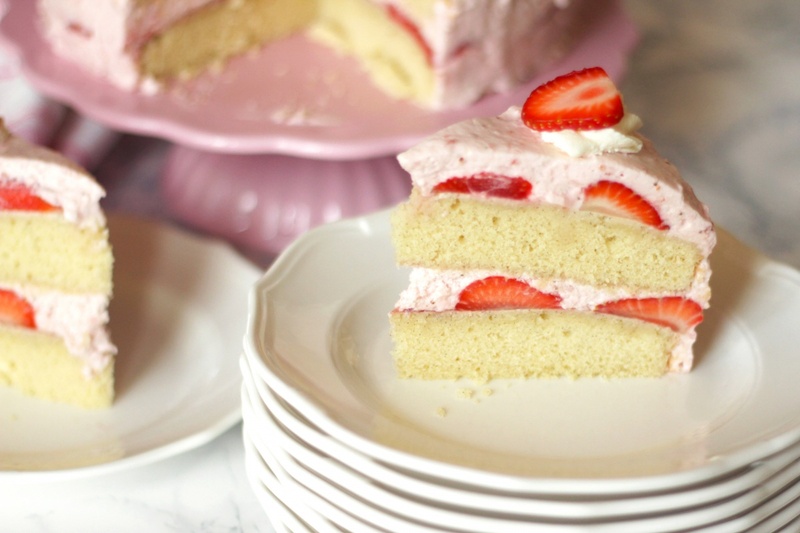 This is an easy vanilla bean cake layered with fresh strawberries and strawberry-rosewater whipped cream. Strawberry whipped cream is delicious as it is and I have made this cake with fresh strawberry whipped cream countless times. 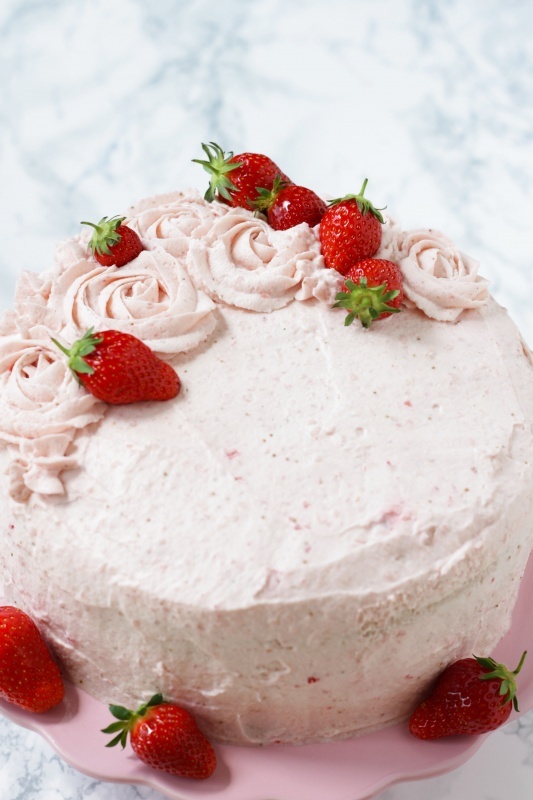 The inspiration to try adding rose water to the strawberry whipped cream came from Kiki at Cinnamon and Coriander with her Rose & Strawberry Mousse Cake with Marzipan. The delicate rose flavor pairs so beautifully with the fresh strawberries and everyone who has tried this cake has loved the strawberry-rose flavors. As you can see in the photos, I have decorated this cake a couple of different ways using this recipe. You can decorate it and garnish it however you wish. The delicate rose flavor pairs so beautifully with the fresh strawberries and everyone who has tried this cake has loved the strawberry-rose flavors. To make the Vanilla Bean Cake: grease and flour two 9-inch (23 cm) round cake pans and line the bottoms of the pans with a circle of parchment paper. Preheat oven to 350° (170°C). Whisk together flour, baking powder and salt in a medium-sized bowl and set aside. Beat the butter and sugar on high speed until light and fluffy (3-5 minutes). Add the eggs, one at a time, and beat until incorporated. Add the vanilla to the milk. Add one third of the flour mixture to the butter-egg mixture and beat on low until well combined. Add one third of the vanilla milk and beat on low until well combined. Repeat procedure with the remaining flour and milk mixtures, scraping the bowl between additions. Pour batter into prepared cake pans. ** Bake for 20-25 minutes until a toothpick inserted into the center of cake comes out clean. Cool cakes completely in pans on a wire rack. 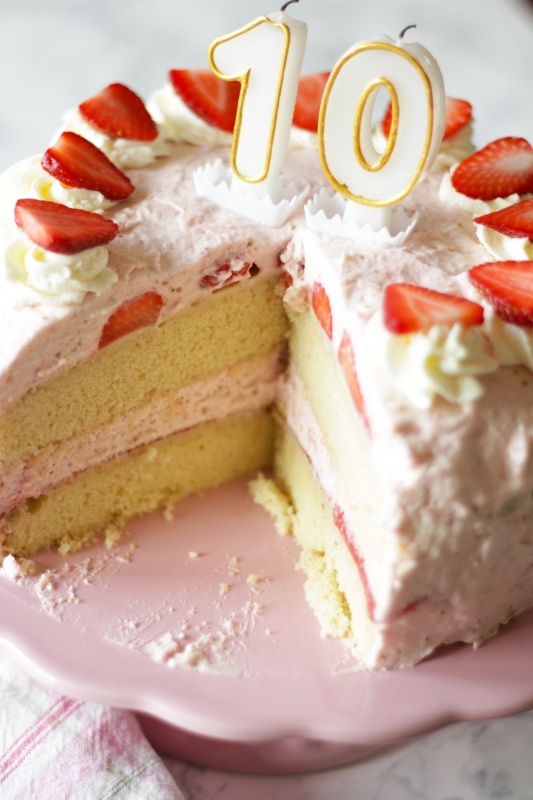 For the Strawberry Rose Whipped Cream: if you plan to use strawberries as a garnish on top of the cake, set aside 8-10 of the prettier ones. Set aside enough medium-sized strawberries to, when cut in half, cover both cake layers. Remove the tops of the remaining strawberries and puree strawberries. Whip the whipping cream 1 cup at a time with the whipping cream stabilizer, following the directions on the packet, and ⅓ cup (37 g) powdered sugar until stiff. Put all of the whipped cream into a bowl and carefully fold in 2 cups of the strawberry puree. Fold in rose water, 1 teaspoon at a time, until desired rose intensity is reached. To assemble cake: place one cooled cake layer on your cake platter or stand and cover it completely with the halved, medium-sized strawberries, cut side down. Carefully spread Strawberry Whipped Cream over the strawberries, filling the spaces between the strawberries. Top with the second cake layer, cover it with strawberries and Strawberry Whipped Cream. Frost the sides of the cake with Strawberry Whipped Cream as well. Cover and chill the cake and remaining whipped cream thoroughly before decorating so both are firmer. Decorate and garnish top of cake as desired with whipped cream and strawberries. To make piped roses, use a pastry bag fitted with a large star tip** and make circles in a spiral pattern, beginning piping in the middle of the rose. Store cake tightly covered in the refrigerator. Assembled cake stays fresh for a few days. *Seeds of 6 vanilla beans from Vanilla Extract. Vanilla cake batter recipe is the same as for my Perfect American Vanilla Cupcakes.